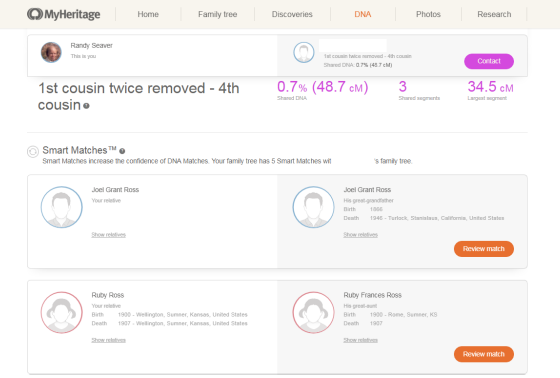 MyHeritage announced a new feature yesterday - the MyHeritage DNA Match Review. Since I submitted my raw DNA file late last year to MyHeritage for analysis, I have been receiving DNA Matches. Unfortunately, until recently, almost all of the matches have either no MyHeritage tree or a small tree with only one to three generations. My current MyHeritageDNA match count is 194, and I finally have several matches that have some common persons in their tree to persons in my tree, and are distant cousins. The first match is AW, who shares 1.1% of her autosomal DNA with me. However, she has only one person in her MyHeritage family tree. 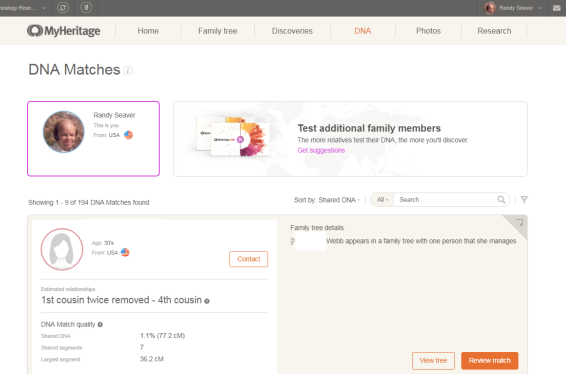 The screen above shows me Smart Matches - there are a number of persons in my MyHeritage tree that are the same persons in CR's MyHeritage tree. CR has much more information for this family than I do because he is directly descended from the persons in his tree. I looked carefully through the list of Smart Matches, and found that CR and AW are descended from Nora Delia Carringer (1871-1902). Nora is my 2nd cousin twice removed, and is in my MyHeritage tree. She is CR's great-grandmother. The common ancestors are my 4th great-grandparents, Martin and Magdalena (Hoax) Carringer, who are CR's fifth great-grandparents. So CR is my 5th cousin once removed, and AW is my 5th cousin twice removed. Based on some of CR's family tree data, I added some of this line to my RootsMagic database, but not yet to my MyHeritage tree. 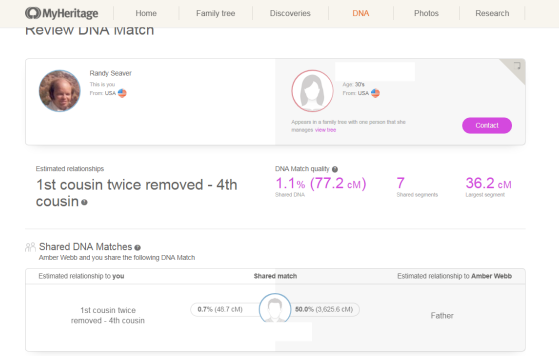 This MyHeritage DNA Match Review worked pretty well for me on this particular DNA match. I will continue to monitor my MyHeritageDNA matches for information about the families of my DNA cousins. 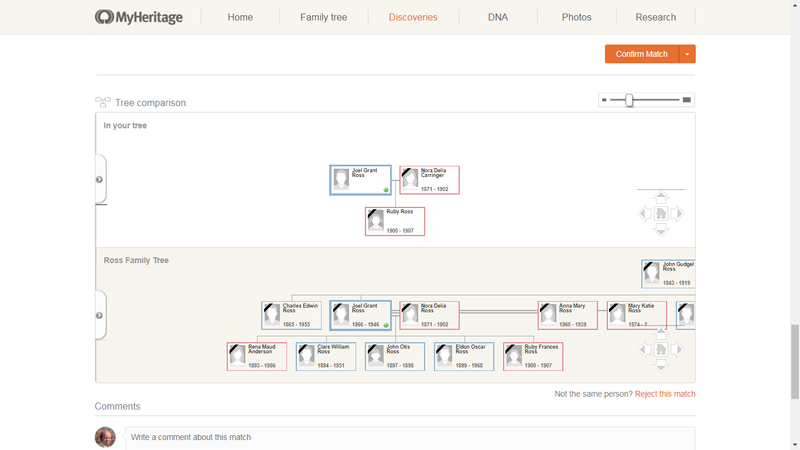 Please read the MyHeritage DNA Match Review blog post for more details on this new MyHeritageDNA feature. Thanks for sharing this, Randy. 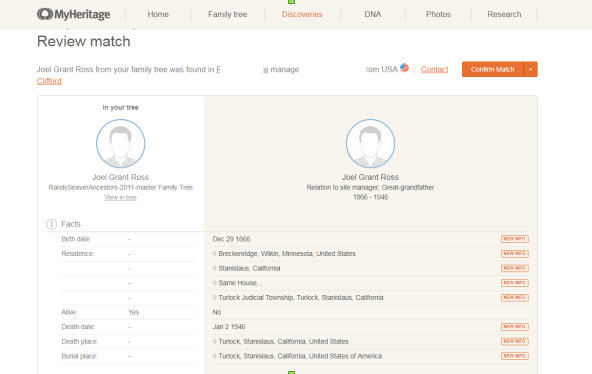 Like you, I've found that many people on MyHeritage have sparse trees or just themselves listed. It can be very tricky to figure out the shared ancestor. I've also found the Review tool handy for an at-a-glance view of the person, tree, and shared matches. Randy, you missed some anonymizing--image 2 identifies relationship with AW's full name, image 4 shows Contact hyperlink showing AW's father's first name.